This package is for the NEW Line Dancer / Aging Line Dancer or the Instructor who teaches new line dancers. 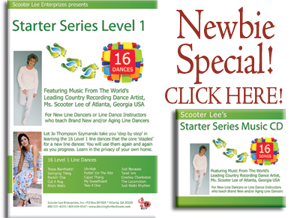 It contains the Starter Series Level 1 DVD with 16 Line Dances that are the basics every NEW line dancer should know....plus the Music CD with the 16 songs to match the dances on the DVD. Dances are all 4 Rhythms so there isn't a song out there that YOU or YOUR New Line Dancer can't dance too. As a new and/or aging line dancer, we have taken the guess work out of what you need to know by teaching you the basics that you will use over and over again on the dance floor. Comes with Step Sheets and we are throwing in the Music CD at absolutely FREE. Scooter Lee Enterprizes Inc Order by Clicking Here!